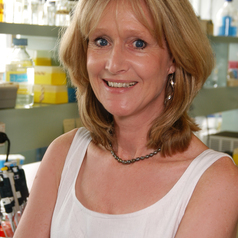 Hazel Mitchell is Professor of Medical Microbiology in the School of Biotechnology and Biomolecular Sciences (BABS) at the University of New South Wales, a position she has held since 2006. Professor Mitchell’s major research foci over the last 25 years include investigation of the epidemiology of H. pylori infection. She was one of the first in the world to study the epidemiology of H. pylori infection and to develop and commercialize an ELISA assays for the diagnosis of H. pylori infection. Further areas of her research include investigation of the role of H. pylori and host genetic factors in gastric cancer, and the role of mucous associated bacteria, including H. pylori, in Inflammatory Bowel Disease. Interestingly this latter study led to the recognition that Helicobacter pylori infection decreases the risk of IBD. In a recent research study, she was a collaborator in a study investigating the efficacy of microbiota transplantation (FMT) as a treatment for ulcerative colitis UC. In 1996, Professor Mitchell co-founded the Western Pacific Helicobacter pylori study group and was convenor of the first meeting in Guangzhou, China and the International Scientific Adviser for subsequent meetings in Malaysia, Indonesia, Australia, Japan and Thailand. In 1996 she co-founded the Western Pacific Helicobacter pylori study group and was convenor of the first meeting in Guangzhou, China and international scientific adviser for subsequent meetings in Malaysia, Indonesia, Australia, Japan and Thailand. She has published 190 peer-reviewed journal articles, 16 book chapters and co-edited a book entitled “Helicobacter pylori in the 21st Century”.